With spring upon us and good weather coming in, what better way to brighten up your home than with new blinds? SG Blinds have nearly two decades of experience in providing top quality blinds at low prices to their customers. “My business partner Gary and I worked for a blinds company for many years, giving us over 16 years of experience between us,” says owner Stuart Glass. “We decided to start out on our own and have been doing so for over four years now. We learnt a lot about running a business before we made the leap, which is one of the reasons I think we have been so successful. “The secret to running a successful business is to keep your overheads as low as possible. The fewer overheads you have, the lower the price to the customer. It is very important to have a good relationship with the customer,” he added. SG Blinds’ biggest success to date are contract jobs such as the Scottish Provident building in Belfast, beside City Hall. Jobs like this means the company has increased its customer base, ensuring around 70 per cent of their work comes from recommendations. 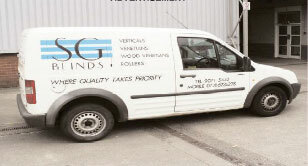 SG Blinds ensure all their work is carried out to as high a standard as possible. “There is very little that we don’t know about blinds,” says Stuart. You can find contact details for SG Blinds on our new Services directory here.